I am seriously addicted to mesmerizing sensory bottles. At one point, I had a calm down jar that I “tested out” for an entire week before I gave it to my class, so I am always thrilled for the next irresistible find. The discovery bottle that I am showing to you today is one of my all-time favorites, and it has that nice slow and gentle flow to it. It’s the kind that I could just watch for hours. Now you all know why I’m a preschool teacher — I just want to stare at discovery bottles all day! 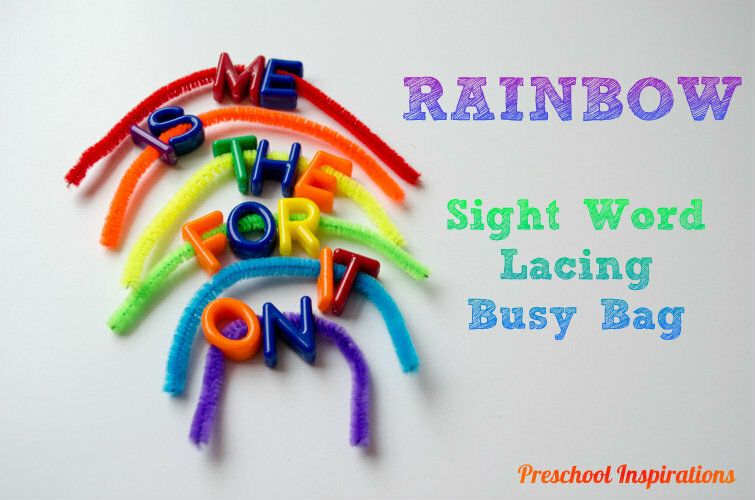 I’m a firm believer that every preschool curriculum should include them. 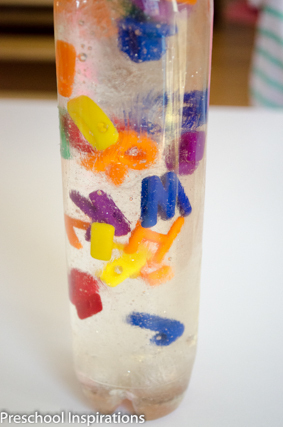 Here’s our alphabet discovery bottle. I must say that the ABCs have never been so calming and relaxing! 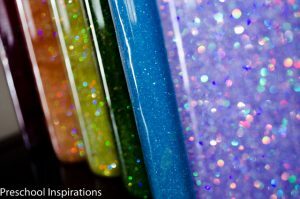 This post contains affiliate links for products that we love and use on a regular basis. It takes 15 to 20 seconds for the letters to go to the other side of the bottle, and I love the slow somersaults they do as they float upward. We love just flipping it over and over as it calms and soothes. A clean empty water bottle. I recommend one that is sturdy with a wide lid such as VOSS plastic water bottle since this is extra heavy for a sensory bottle. I didn’t use a VOSS one this time, and I definitely wish I would have. 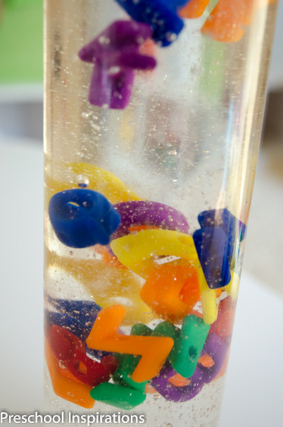 First, put the letter beads into the bottle. Next, add enough corn syrup on top of it that it covers about 80-85% of the inside of the bottle. Add a very slight amount of hot water and shake. Then continue to add corn syrup and water until you get your desired flow. The ratio I used for my own bottle was about 95% corn syrup and 5% water. Initially, your bottle will look “streaky” as the corn syrup settles. It can take a few hours to fully blend. I personally like the streaky swirls in the meantime! 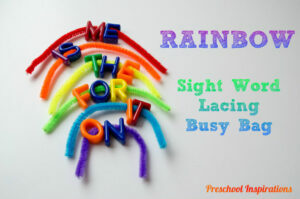 While I used big letter lacing beads, most any plastic item would be a good substitute. I love the blend of literacy and science in this particular one because I am always trying to sneak in a love for reading. This could also be used to help a child learn the letters of his name. A miniature bottle would be perfect to put them in. 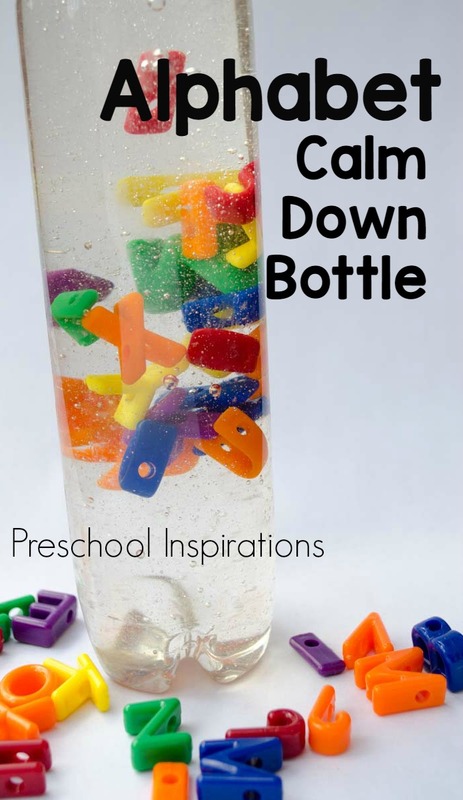 Follow Katie | Preschool Inspiration’s Discovery Bottles board on Pinterest. 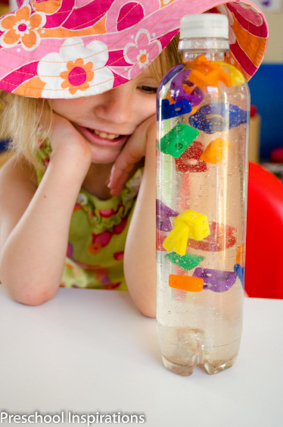 Just made our first calm down bottle… This looks so fun! May need to try one of these next. Calm down bottles are soooo amazing, There’s Just One Mommy! Discovery bottles can be super addicting, in the best way possible of course :). It’s a pleasure to have you visit! I love the colors in this bottle. I’ve never done these jars before, how come you need to add water? Does it help the objects inside float better? Isn’t it so vibrant and fun, Amy! The water definitely helps them float at a quicker rate. You could always try one without any water and see which you prefer. Thank you for visiting :). How long do the bottles last? Could I use them in my classroom for more than one year? 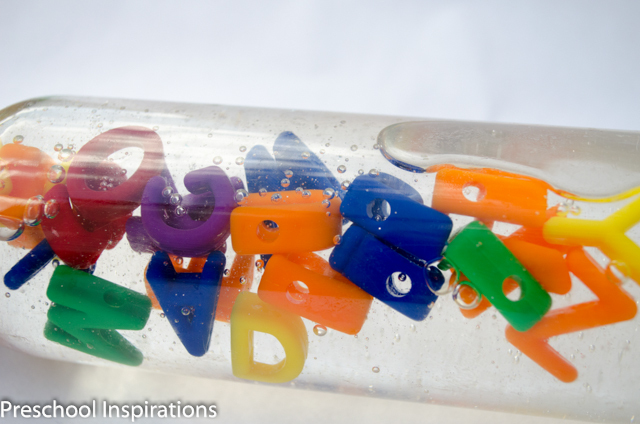 As long as you make sure to clean the letter beads (or use brand new ones), you can use them for a long time. Otherwise they could grow things if they are not clean, if you know what I mean! I’ve had several discovery bottles around for years, including this one. You may want to change the actual bottles out after time because they will get bent from being dropped or have fingerprint oil that takes away the sheen that they had in the past. That’s easy to do too though. I hope you enjoy making one :). 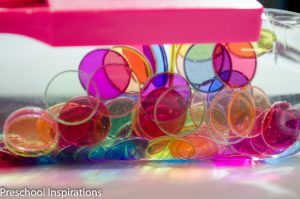 I love this idea and plan on making them with my kindergarteners when school begins. 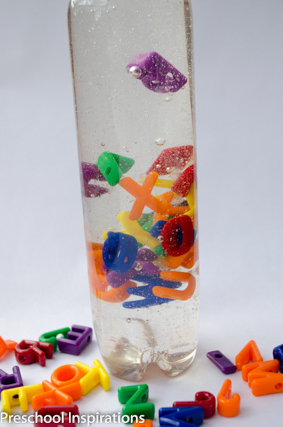 I’m going to add it to my activities to go along with Chicka Chicka Boom Boom and have the students put the letters of their names in their own individual bottles. Question….you wrote that it takes mostly corn syrup. Corn syrup can be very expensive. I have 18 students, therefore it would cost me over $100 on syrup…yikes! Do you have a special place to buy the syrup at a cheap price or any other ideas to cut down on the cost? Hi Renee! I love that idea! You absolutely can buy corn syrup in bulk. We have a giant container from Winco. I would also suggest using smaller bottles and try making one with half corn syrup and half water to see how it turns out. 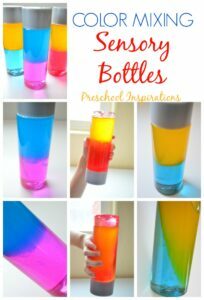 Sensory bottles can be made differently, and if I was making a bunch, I would certainly improvise myself :). What a great idea! Would I need to modify this to use for a two year old?